The Recent progressions in video technology have lowered the cost and improved the quality of video equipment for Broadcasters, Filmmakers, House of Worships and Live Production. Higher quality is more accessible by Consumers than ever before. As the differences diminish between basic, advanced, consumer and professional, truly understanding what video is and what video quality means has become increasingly difficult. At Apocalypse the professional Network of our video teams performs continuous research and analysis of the latest trends in Analog, Digital, and High Definition. Our Development through Application program enhances Apocalypse position as being ahead of the curve in current and future video products and production techniques. If your needs are basic we can help you plan accordingly to maximize your investment now and provide you with the infrastructure to accommodate the future. If you already own an advanced system we will take you to the next level and beyond in an easy transition. Beyond designing for spaces oriented for human connection, we work hard to ensure that working with us is always a great experience beyond implausibility. Each one of our designs is quick and responsive, made-to-measure for your specific application. We are committed to great decisions, delivered apace, without changes of mind. We don’t believe in change just for the sake of change. We are driven by experience and expertise, and are enthusiastic about getting more adept at what we do every day. For over 18 years we have been innovators in conception and applied science, and we have seen the field transform and grow. We have worked with world class design and engineering teams to create venues which affirm the experience of both the patron and the performer. We have originated the acoustics signature of the space to meet the unique needs of the programme. The only ISO 9001:2008 certified consulting Acoustic and Audio-Video, Lighting engineers in Telangana & Andhra Pradesh. 14 years of proven consulting track record with the largest client base in Telangana & AP. Provided consultancy and Services to market leaders like GE India, JLL, L&T, Naval Dock Yard, IAF, TV5 for their infrastructure, projects & buildings. Are specialist Technology and Acoustic consultants to all Broadcast companies in Telangana & AP. Member of AES,ASA, ASI, AFASA, IOA, IINCE & SOA. Uncompromising ethical standards, professional commitment, and independence. “User Experience,” not “System Supply” driven engineering with passion for perfection. Continuous value engineering to achieve the fine balance between the cost factor and a impracticable perfection technology design approach. 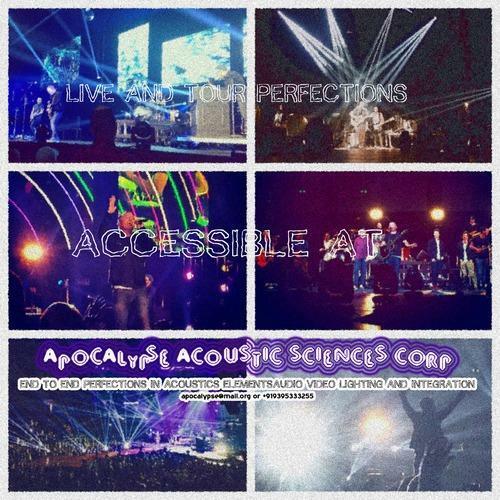 Threshold of salvation...Apocalypse Acoustic Sciences Corp.